So, the story goes (our story, not his story, which we’ll get to soon), hubby enjoys sci-fi movies, and about five years ago, he came up with his own idea for one. And since he doesn’t like to read or write (did I tell you we’re opposites? ), he asked me to write it. Now, this is where I double checked the vows I made on our wedding day. Even though I hadn’t promised “to have and to hold and to write a book together”, I agreed to do so because I love my hubby. Oh, how I must love him … because I had NO idea what I’d gotten myself into. LOL. Writing this book together took five years to complete—that’s almost a third of our marriage. A lot of things happened during that time, including a big job change for him, a dozen books published for me, and the challenges both of us faced in raising our two munchkins. Whenever we could though, hubby would write a chapter here and there and I would edit (AKA rewrite) it. Thanks to the wonder of Google docs, lots of coffee shop visits (for hubby), some hair pulling (for me! ), one title change, and some storyline revisions (thanks to the help of our awesome beta readers), we ended up with a grand total of 73,861 words. We are so relieved to be finished with this book. Now comes the exciting (and scary) part of putting it out into the world for all to see. 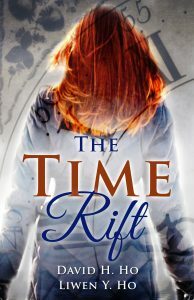 So, without further ado, here’s the cover reveal for The Time Rift! Renowned physicist Lance Everett has two great passions: donuts and time travel. The only thing that rivals them is Juliet Bradley, the redheaded beauty who captured his heart at a college football game. After reconnecting with her a decade later, Lance can’t imagine his life being more complete. Even without a time machine, he foresees a happy marriage and a breakthrough in his scientific pursuits. Now Lance is left searching for answers and questioning what he values the most. A chance encounter with a mysterious man offers him some unexpected solace, as well as the opportunity of a lifetime. But the stakes are higher than he ever imagined. Will he risk it all to gain back what he lost, even if the consequences can never be reversed? You can pre-order The Time Rift now for only 99 cents*! If you enjoy sci-fi, especially time travel stories, we hope you’ll check it out! *Release day will be March 21st, and the print version will be ready a week later. This entry was posted in Makings and tagged cover reveal, sci-fi, writing.